Jacqui Sharpe opened Fika Bakery & Coffee in 2017 with her husband, Brandon Sharpe. When was the last time you intentionally took a break during the day? Fika Bakery & Coffee in Three Lakes gets its name from the traditional Swedish coffee break known as fika and the woman behind it thinks you should take more of them. Mackenzie Martin continues our We Live Up Here series this week with the story. Coffee breaks are and have always been an important part of life in many countries. In the U.S., we often use coffee as a stimulant to get us going in the morning or to refuel us midday. In Sweden however, their coffee break, known as Fika, is a lot more about slowing down and taking an actual break. Fika Bakery & Coffee is mainly the creation of Jacqui Sharpe. She and her husband, Brandon, have lived up north for over eight years now, and they started Fika in the summer of 2017. Fika gets their coffee roasted on Lake Superior by Fika Coffee, though there’s no relationship between the two businesses other than that they share the same name. Sharpe says the coffee is generally roasted on a Tuesday and then they’re brewing it by Friday or Saturday. Sharpe is clear though that at Fika, they take the baked goods just as seriously as the coffee. Then she hit on Fika, the traditional Swedish coffee break. In addition to the concept of Fika, Sharpe also loved the culture and traditions around baking in Sweden. Just like in the Northwoods, their winters are long and hard, but they embrace the winter and make do with the local produce they have. Sharpe wanted to do the same thing at Fika. She says she enjoys the challenge of being creative with rhubarb and cranberries, but she says their menu often surprises people. When there’s less local produce—like right now—Sharpe produces about 85% traditional Swedish baked goods, a lot of which incorporate the spice cardamom. 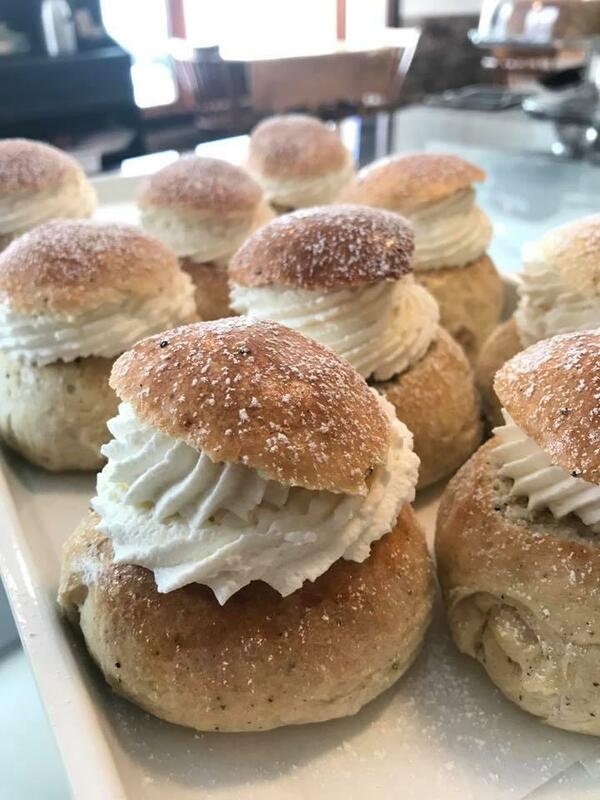 Through March at Fika they have the Swedish delicacy Semla, which is traditionally eaten around Fat Tuesday. It’s a cardamom bun filled with almond paste and whipped cream. Their menu is always changing, though. They’re also featuring chocolate truffles and heart shaped cookies ahead of Valentine’s Day right now. As far as Swedish drinks go, they use Swedish oat milk as a dairy alternative and in the spring, they make a Swedish rhubarb cordial that’s somewhere in between bitter and sweet, served sparkling or flat. Jacqui Sharpe and her husband, Brandon, moved back up north over eight years ago because they fell in love with the slower pace of life in the Northwoods. They’re happy that at least for the Three Lakes area, they can offer a morning or late night spot for people to gather, relax, and take a break together. She says they have a lot of different groups that meet there. The night I visited, there was a book club. For more information on Fika Coffee & Bakery, find them on Facebook or visit them in downtown Three Lakes. This story is part of our We Live Up Here series, where we tell the stories of the people and culture of northern Wisconsin. Music for this story came from Blue Dot Sessions: Brass Buttons by Blue Dot Sessions (www.sessions.blue). On Thursday, December 6th, Finns around the world celebrated Finland’s Independence Day. The day marks Finland’s declaration of independence from Russia in 1917. It’s a holiday that we also celebrate here in the Northwoods, because of how much Finnish heritage we have. At Ponsse North America in Rhinelander they celebrated the day as well, since Ponsse was started in Finland. Mackenzie Martin has the story.